Spring 2017 is shaping up to be a very colorful time of year for Mountain Melody Women’s Chorus. “Colors of Spring” is the title of their upcoming concert series. The concert includes several lovely tunes sung in Spanish, “De Colores” and “Duermete Nino.” A delightful a capella tune, “Chili Con Carne,” which uses all kinds of rhythm and percussion sounds as well as melodic lines, also has a spicy Latin flavor. The vibrancy and beauty of Calaveras County is reflected in many of our musical offerings. Spring in the countryside is definitely the time to enjoy the richness and color of vocal ensemble singing. Mountain Melody’s Colors of Spring Tee-Shirt and more products are available at TeePublic! 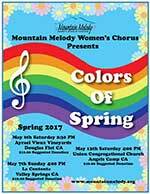 Spring 2017 is shaping up to be a very colorful time of year for Mountain Melody Women's Chorus of Calaveras County. Sign Up for Mountain Melody’s Email List!